Definition at line 23 of file messagebox.c. Definition at line 33 of file messagebox.c. Referenced by MessageBoxProc(), MessageBoxTextToClipboard(), MessageBoxTimeoutIndirectW(), and SoftModalMessageBox(). Definition at line 39 of file messagebox.c. Definition at line 37 of file messagebox.c. Definition at line 26 of file messagebox.c. Definition at line 25 of file messagebox.c. 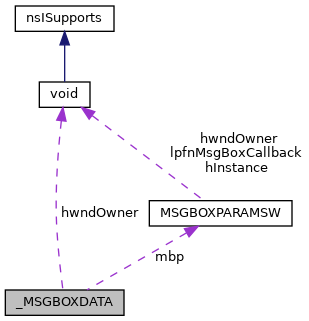 Referenced by MessageBoxProc(), MessageBoxTimeoutIndirectW(), and SoftModalMessageBox(). Definition at line 31 of file messagebox.c. Definition at line 32 of file messagebox.c. Definition at line 35 of file messagebox.c. Referenced by MessageBoxProc(), and MessageBoxTimeoutIndirectW(). Definition at line 34 of file messagebox.c. Definition at line 30 of file messagebox.c.